Back by popular demand, Bopology returns to Cutting Hall Performing Arts Center, 150 E. Wood Street, in Palatine on Sunday, April 22 at 3:00pm for a Musical Matinee concert. Recognized as a “Top Chicago Swing Band,” Bopology’s musical tribute to the Rat-Pack and the Swing Era is a show you can’t miss! Bopology was established in 1992. 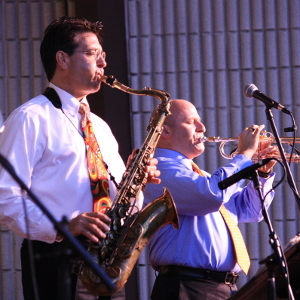 The six-piece band delivers authentic swing and jazz music with tight arrangements and foot-tapping dance steps. They were nominated as 2017 Best Jazz Band by the Chicago Reader. Concert only tickets are $10.00 and can be purchased in person at the Cutting Hall Box Office, by phone at 847.202.5222, or online at cuttinghall.org. A limited number of all-you-can-eat Prime Rib and Pasta plate dinner and concert package tickets are also available for $40.00 per person. Dinner will be available at Emmett’s Brewing Company, 110 N. Brockway Street, in Palatine immediately following the performance. Musical Matinee attendees will each receive a complimentary goody bag and one free raffle ticket with the option of purchasing additional tickets at the theatre to benefit the Palatine Park Foundation‘s Susannah’s Gift scholarship fund. This dedicated scholarship fund helps Palatine residents in need of financial assistance participate in Palatine Park District cultural arts activities. In addition to Musical Matinee’s presenting sponsor, Plum Creek Supportive Living, support has also been received for this event from the following gold level sponsors: Berkshire Hathaway Starck Real Estate – Sue Gould, Palatine Township Senior Citizens Council, Lifeway, Azpira Place of Lake Zurich, and Cornerstone Bank. For more information, call the Cutting Hall Box Office at 847.202.5222, or contact Cultural Arts Coordinator Ashley Schiavone at 847.496.6237 or aschiavone@palatineparks.org.